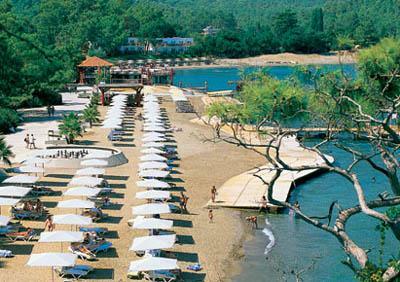 Club Phaselis is a first class Holiday Village. The Village is 45 km from the Antalya International Airport, 40 km from downtown Antalya and 5 km from the nearest town Kemer. Transportation can be done by taxi, minibus or bus. 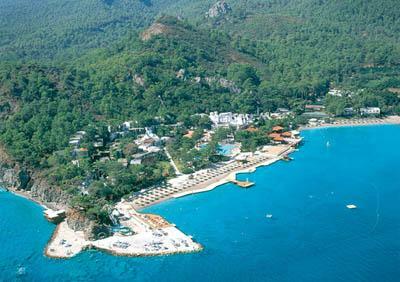 Club Phaselis is located down at the skirts of Taurus Mountains where it meets the shores of the Mediterranean Sea. There are two main restaurants for the open buffet. 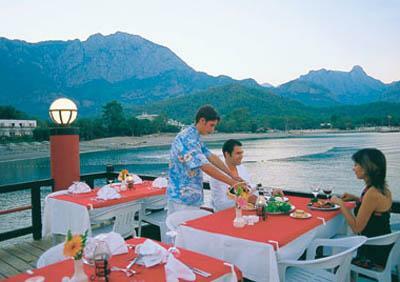 There is also an a la carte seafood restaurant which is on the water. There are four bars, an Ice cream Parlor, Turkish Coffee House, TV room, Atari and Billiards Saloon. There is a Bazaar with a variety of stores such as a Market, Jewellery Shop, Leather Shop, Souvenir Shop, Hairdresser and a Boutique. There is a meeting room with 250 seating capacity. There are two outdoor swimming pools and two jacuzzies, children pool and miniclub,amphitheatre, indoor and the outdoor disco. Tennis courts, table tennis, beach volleyball, basketball, mini football, sauna, jacuzzi, Turkish bath, fitness, windsurfing and catamaran with licence, canoe, sea bike, internet, TV room, game room, darts, air-rifle, archery, mini golf,. 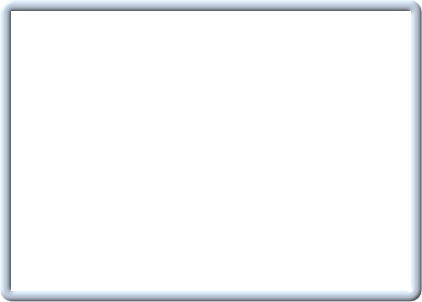 Lightning of the tennis courts, tennis equipment, tennis lessons, jet ski, parasailing, banana, ringo, water ski, diving school, windsurfing lessons, massasge, peeling, beauty center, foam massage, laundry, telephone, fax, shopping center, rent a bicycle and car, fresh fruit juices, baby sitting. 304 newly remodeled deluxe rooms. All the rooms have, a/c - heat, safe boxes, mini bars, TV, telephones, showers, bathtubs and hair dryers. Some of the deluxe rooms come with a terrace. 700 meters long, private pebble-sandy beach with Blue Flag. All local alcoholic & non-alcoholic drinks and some imported drinks.